While pregnant, even before I was pregnant I spent hours researching and trying out a multitude of different strollers. For some reason the stroller was extremely important to me, it had to be perfect. I imagined myself strolling along with my wee babe perched perfectly in my stroller. I finally found the most perfect of strollers, a phil and teds, and was thrilled when people decided to help us purchase it. It is fantastic. It is compact and easy maneuver, it can climb over some pretty difficult terrain, yet it is pretty and glides through the mall with style. It has it's uses. Once Isla was born though, I wanted to hold her; Don't get me wrong there are times that a stroller is easier, more useful, but the way I wanted to nurture my wee little lady was by holding her in my arms. 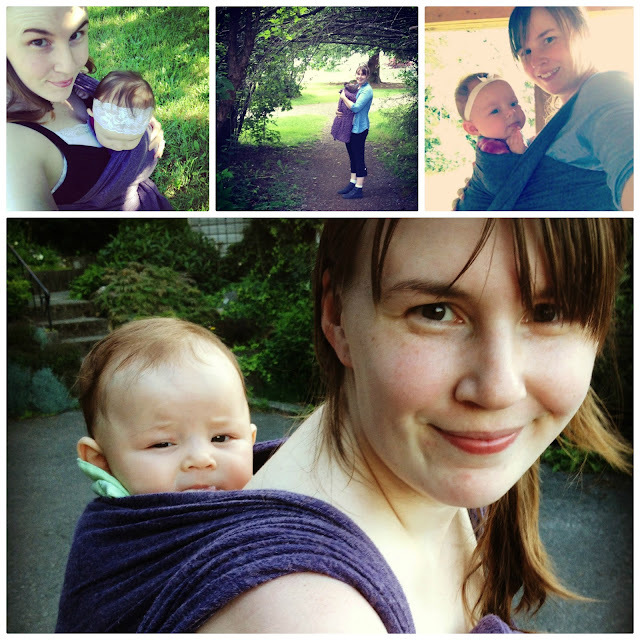 I had wanted to be a mommy for years, I longed after it for so long that once it finally was my turn I gleamed in it. I loved being pregnant and knowing that there was a little person growing in me, she was always with me, and I didn't want that to end once she was born. It was so natural for me to carry her, her body swooned in my arms and molded like clay against my body. And so I carry her. I wrap her little body against mine and walk with her, swaying as she envelops the world around her completely allured by the trees, the leafs, the sounds of birds singing, yet safe and close to me, mommy. She knows my sway, my gate is familiar to her, she felt it while she lived inside me. My heart beat pounding against her body is a rhythm she fell asleep to. I am her carrier. She will only be small for a short while, someday she wont want me close, so while she does I will have her against me where I can smell her hair and breath in her breath. I will use the stroller when I need to but my baby will not be a baby for long. I am her home, and she is my heart.